A moniker like the one above might lead you to assume that dish describe herein simply has lemon and pepper mixed in during the final stages. While this is certainly true – as I have made and written about other versions of this dish in the past – this particular dinner was created to showcase one of the most recent results of my newfound obsession with pasta-making: fresh lemon-pepper pasta. This recipe was a little bit of a risk (a relative statement of course, not taking into account actual risks, like skydiving and the like). I’m not a huge fan of foods that are overly-lemony, and my wife doesn’t prefer a lot of spice, so part of the challenge was going to be finding a nice balance of the lemon and pepper. After a little online reading – which I try to avoid because it takes all the fun out of the experimentation process while cooking – I had a good idea of how I should approach the mixture. I decided to give the dough-hook a second try, and I have to say that I now officially retract my previous statements; it is a wonderful time-saving device. Puree the juice and zest of the lemon, the olive oil, the peppercorns and one egg in the food processor. 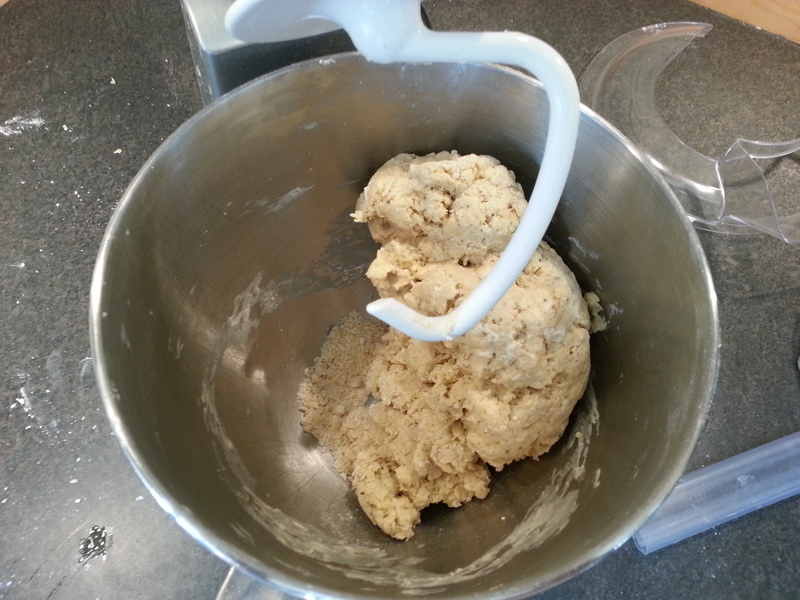 Meanwhile, begin mixing the flour and the remaining three eggs with the dough-hook. This process can, of course, also be done by hand. Once the lemon mixture is relatively smooth, slowly pour it into the bowl and allow it to mix into the flour. Once the lemon is mixed in, slowly add the water, one tablespoon at a time until the dough begins to ball together. When the dough balls up, remove it from the mixture and place on a lightly floured work surface, and continue to knead by hand for another five minutes. 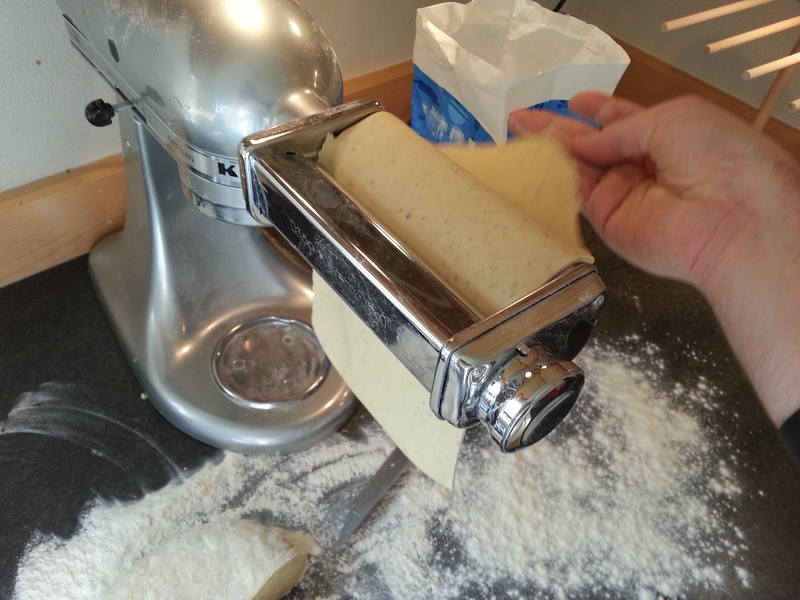 Roll out the pasta to desired thickness, and cut into noodles. 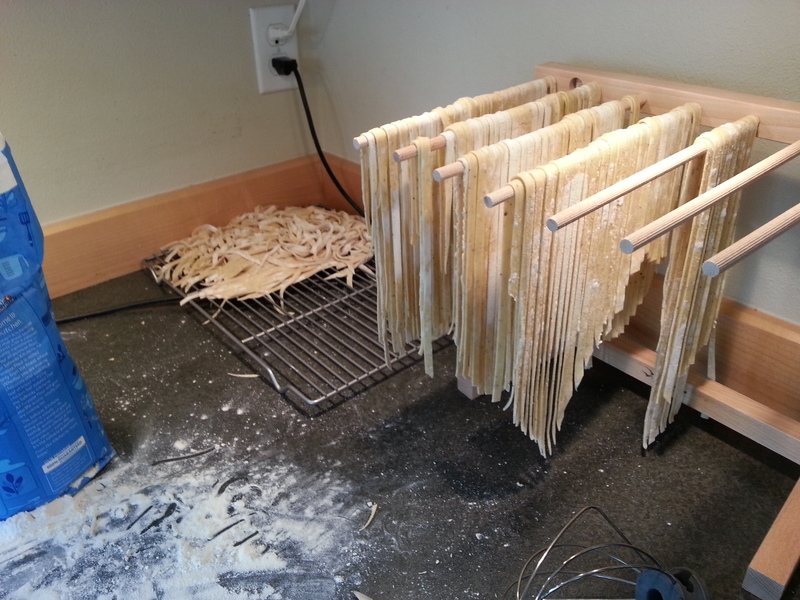 This four-cup dough recipe yields a lot of pasta, so I choose to hang-dry most of it, and cook about ½ to ¾ of a pound for this recipe. Cook the pasta in salted, boiling water for 2-3 minutes, strain it, and rinse quickly with cold water. Meanwhile, saute the asparagus tips in ½ tablespoon of olive oil and a pinch of salt and pepper. 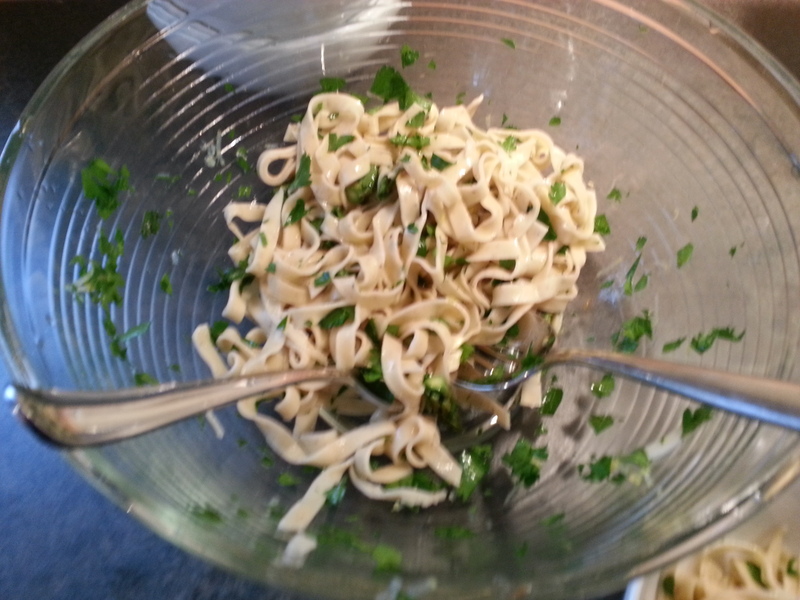 Toss the strained, rinsed pasta with the chopped parsley, olive oil, lemon juice and seasoning.I prefer this as a cold dish, but it could be served warm if you so choose. Serve into portions, and then add asparagus and crab and mix in individually. I tend to serve the crab and asparagus in this manner for two reasons; (1) some guests may not prefer the addition of the asparagus, and (2) this allows each person to choose to add as much or as little crab as they prefer. Note: I prefer MORE crab because it’s delicious. You should make food that I can eat too. It’s 5:05 pm. I can’t read your blog this close to dinner. It’s here to make you hungry! It’s VERY good. Clean and simple, with flavors that complement each other nicely. Give it a try!